This joins a long list of innovative engine designs that have been worked on over the years. They all have specific advantages that make them attractive to continue development, yet usually run into the limitations imposed by materials. That is why we still use the same engine geometry developed a century ago. This one looks attractive and looks to be naturally light. One hopes it makes it into the market. The video could not be transferred, so for a longish discussion – no demo – use the link to get the video. (PhysOrg.com) -- Researchers at Michigan State University have built a prototype, based on the research first released in 2009, of the Wave Disk Generator -- an engine that does not have pistons, crankshafts or valves. This new model, which does away with the internal combustion engine of the past, has the potential to reduce auto emissions up to 90 percent, when compared to the current emissions level. This is because the engine uses roughly 60 percent of its fuel for propulsion, when you compare this to the typical cars engine that uses only 15 percent of fuel for propulsion, we can see how the increase is possible. 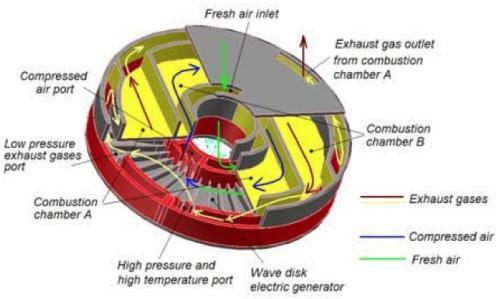 The new engine prototype is built with a disc-shaped shock wave generator that is about the size of a sauce pan, and will require no transmission system, cooling system, emissions regulation or fluids, which means that you will end up not only doing something good for the planet, but you will end up with less in maintenance costs, if this new prototype ever comes to the market. The engine works like this: a rotor, with a wave-like pattern carved into channels. The fuel and air enter and mix through the central inlets. The rotor then spins, blocking the exit of gasses. As the pressure builds it will generate a shock wave that will compress the mixture. Once it is ignited an outlet opens to let the hot gases escape, and your car can move as usual. The engine prototype was shown off by Norbert Müller and other colleagues at Michigan State University at a meeting with the Department of Energy’s Advanced Research Projects Agency.